The Korea-based consumer electronics giant, Samsung has launched its SPH-W8700 which known as Honey Bubble in Korean market. The slider phone has been designed with bubble-shaped patterns in various colors on the back of the phone that makes it attractive and cute. 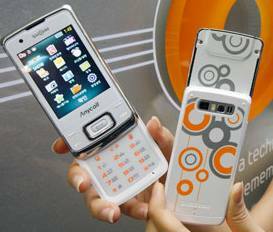 Featured with a 2-megapixel camera with panorama mode, Samsung Honey Bubble is also equipped with a MP3 player. It features with subway maps, M-Commerce and a DMB TV tuner for watching live TV while on the go. In addition, it is Bluetooth enabled, supports GPS and microSD card. The Samsung Honey Bubble phone with 3G supports is expected to be available in Korea for the price of $325.